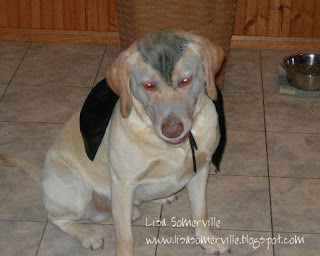 Okay it's NSR, but it's Halloween - and even the dog got in on a little Halloween fun! Now that is just too cute:) My little granddaughter just stopped by to trick or treat & she had her dachshund with her & he was in a hot dog with ketchup costume. I love your Dracula!!! Too funny. Lou is such a good sport! Suzy hid in the corner of the kitchen every time someone was at the door! So, I guess you could say she was a chicken for Halloween! Very funny! Like your new blog background--very "fresh"! This is hilarious! I love it. Our pooches greeted our neighborhood goblins in a spider and bee costume. 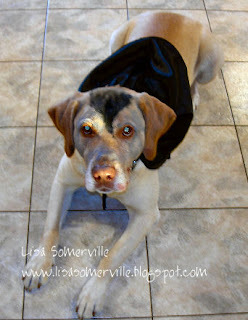 Dracula Lou should get double the treats for being such a good doggie! She is too cute! Love what you did to your dog. Our dog Sonny went as Toto one year while the daughter was Dorothy. It was slow going since Sonny had to stop at every tree!